Tired of lag and bad frame rates? 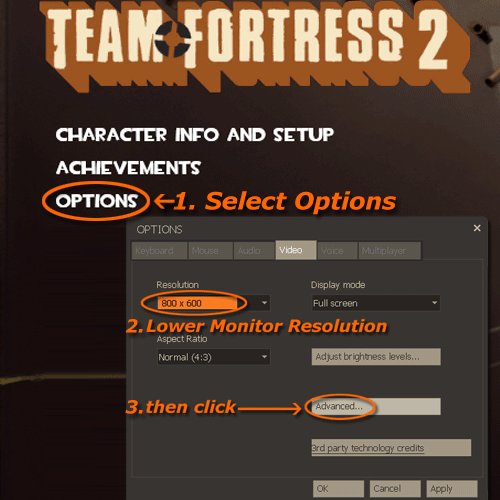 This Team Fortress 2 performance guide goes over the "advanced video settings" menu to help increase your FPS in TF2. Keep in mind that even though this guide will try to help you tweak your video settings for optimum performance, since every computer is different, this TF2 fps guide may produce varying results. I make no guarantee that this guide will solve your problems, but it's a good start and chances are if it doesn't work, your old computer may just need an upgrade. With that out of the way, here we go! Alright, to get started you'll obviously need to run TF2. Select: "Options" from the TF2 Menu then select "Video". If your monitor is a an old LCD(square screen) or if you're a CRT user, most likely your aspect ratio will be 4x3. Set your resolution to something low like 800x600 or at most, 1024x768. If you happen to have a widescreen monitor (rectangular) your aspect ratio will be either 16x9, or 16x10. Set your resolution to something low like 1280x768 or at most, 1280x800. Note: After completing this FPS guide I recommend that you switch between the two lowest resolutions and see which one is balanced better between performance and visual quality. For example, if you can get away with using a higher resolution and only end up losing 5fps overall, it may be worth switching to the higher resolution. Once you've selected that, go ahead and select "Advanced Settings" as per the image below. Detailed below is my personal recommendation for most systems that are suffering from performance issues. One very important option to note is "Multicore Rendering". Make sure to disable this setting if you don't have a multi-core cpu or processor, or it may cause stability/lag issues. AA was created to counter the rendering of rough, jagged looking lines. They are quite noticeable in lower resolutions, especially on any diagonal lines. What should I set it to? If you play at a higher resolution like 1680x1050, you may want to set this option to below 4x or even off. AA can create a huge performance hit depending on the power of your video card(s). If you're having performance problems or are using video hardware that is a few years old, I recommend turning this setting completely off. Note: On certain N-vidia cards you will actually get better FPS if you leave this option on at around 2x. Experiment between on/off and determine what's best for you. This option forces a specific method to render textures, each varying in quality and performance. The range starts from simple bi-linear passes (2x).. to the advanced anisotropic filter which re-samples each texture up to 16x in real-time preventing the occurrence of artifacts and improving the quality of textures. Try setting it to "Tri-linear" or AF 2x or 4x. Generally the lower you go, the more frames per second you'll gain. 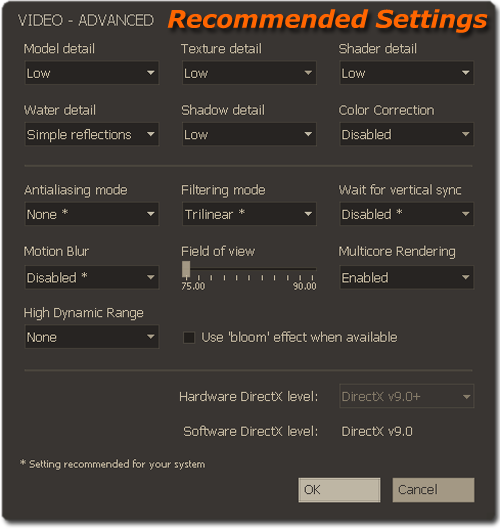 This option allows your monitor to sync each frame with your video card preventing visual artifacts or "screen tearing" to occur. The problem Vertical Sync is that the second your video FPS (frames per second) dips below your monitor's refresh rate, your FPS will be cut nearly in half! This setting is a "must" disable unless your system is an absolute powerhouse, and is the most critical option to help improve performance in TF2. This setting allows users with multicore computer processors (dualcore, quadcore etc) to force Team Fortress 2 to use any/all processors available in the system to increase performance and FPS. Well if you have a multi processor system, "On" of course. In retrospect, if you don't, definitely leave this option off. This option is specific to your graphic card's performance. Shaders control various texture details of Team Fortress 2 such as specular surfaces (glossy wet look) or advanced per pixel lighting information that may be stored. High "Shader Detail" can be a huge performance hit if your system is unable to handle it. If you're looking to optimize TF2 for maximum performance, set this option to "Low". Effect detail controls the amount of detail to be displayed during advanced physic effects such as explosions. This option is a major performance hog. Unless you have a powerful CPU, if you're lagging during combat, this setting may be to blame. Set it to "Low" first and work up from there. This setting does exactly what it says. It controls the amount of texture detail on game models, such as the player class models like the "Sniper" or "Scout". Team Fortress 2 was well coded, and even on "Low", models still look pretty nice. Unless you can handle it, "Low" for now. This setting will disable the post processing rendering effect and should save you at around 10 fps, assuming your bottleneck is indeed your video card. The more memory you have available, the better. Make sure to disable any unnecessary programs that may be running in the background before starting Team Fortress 2. If you're experiencing lockups due to memory problems, see this article. I highly recommend that people who are having performance issues in TF2 download my TF2 FPS Config. Don't forget to check out the other many articles on NLG that help you tweak your computer for optimal performance.